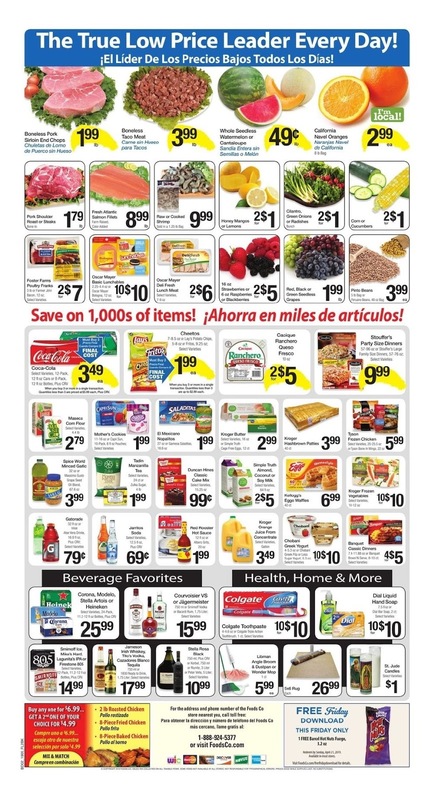 Find the current Foods Co Ad 4/10/19 - 4/16/19 and save with the latest deals for the week. 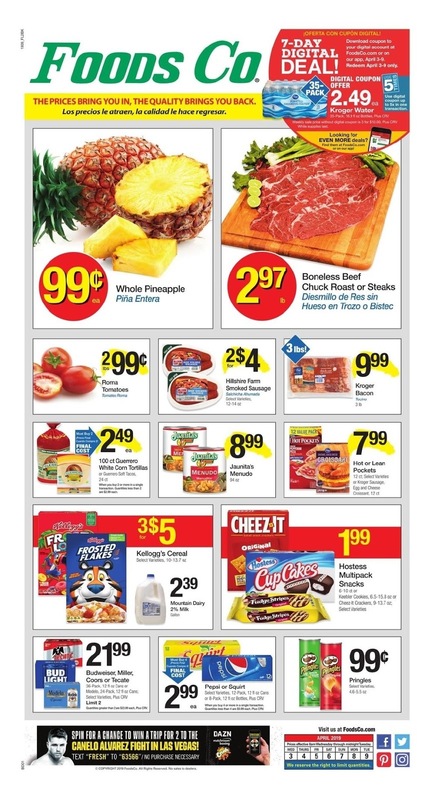 On this page you can browse the Foods Co Weekly Ad April 10 - 16, 2019. To save more at Foods Co, don't forget to find special deals and create a shopping list before go ahead to the store. Also, find the latest coupons and deals from Foods Co.
With the latest Foods Co Weekly Special you can buy many items with low prices such as Hillshire Farm Smoked Sausage, Jaunita's Menudo, Mountain Dairy 2% Milk, Lay's Potato Chips, Colgate Toothpaste, Yummy Chicken Nuggets, Kroger Party Pails and much more. Updated each week, find sales on grocery, meat and seafood, produce, cleaning supplies, beauty, baby products and more. Select your store and see the updated deals today. Foods Co Ad for this week is available in Fresno, San Francisco, Tulare, Lompoc CA, Bakersfield, Hanford, Oakland, Soledad and other locations. Check back this page next week and get the latest Foods Co Specials and Deals. Foods Co. is a discount grocery store chain owned by The Kroger Co. Foods Co. was founded in 1977. In the late 1980s, Ralph stores merged with Food 4 Less and Foods Co. In 1997, Foods Co. was acquired by Fred Meyer, which was in turn, acquired by The Kroger Co. In California, Foods Co. also operates under the name Ralph Grocery Stores.